A Relaxing, Cortisol Reducing, Testosterone Manipulating Cup of Roiboos Tea, Anyone? Plus: From Herpes, Over Liver-Toxicity to Cancer - Things Rooibos Can Do For You! "Decallerate" your life - drink tea!? I am starting to think that I may have totally underestimated Roiboos tea... I mean, tea without my beloved caffeine? That cannot be good for anything, can it? Well, it looks like it can! After a couple of database searches, I did eventually have to realize that the most recent study by Schloms et al. is only the tip of an ice-, or rather "paper-berg" discussing various beneficial health effects of Aspalathus linearis infusions (aka Rooibos [/ˈrɔɪbɒs/], "the red bush" tea) that range from anti-viral to anti-cancer and pro-liver to pro-lung effects. In view of the fact that even I, as a German am more or less lucky to know what Rooibos is and you (mostly US and UK citizens) are only slowly catching up with my countrymen and our Western neighbors, the Dutch, as far as Rooibos imports and consumption is concerned, I just want to clarify that we are talking about a "popular tisane or herbal tea made from the stems and leaves of the fynbos plant, Aspalathus linearis, which is unique to the Western Cape region of South Africa" (Schloms. 2013). What else can Rooibos do for you? Decreased incidence of herpex simplex + beneficial effects on other skin diseases (1.5l tea, orally; Shindo. 1991); liver protectant (Bosek. 2003); no inhibition of iron absorption (Hesseling. 1979; Breet. 2005; no ADHD?). Anti-cancer effects (Marnewick. 2005 ⇋ fermented = more effective; Sissing. 2008); antidiarrhoeal activity (Gilani. 2006); bronchodilator and antispasmodic (Khan. 2006); increased CYP3A activity (metabolizes caffeine, for example; Matsuda. 2007); anti-estrogenic effects in breast cancer ➙ reduced growth (Verhoog. 2007b; note: low estrogenic activity of its ow ➙ SERM)... there is more (mostly on anti-oxidant activities), but I think this should suffice. Rooibos is sold as fermented and unfermented tea. While the latter has a higher anti-oxidant capacity, the former containing unique byproducts of the oxidation process. Contrary to the common perception these molecules are neither metabolic waste nor dangerous toxins, but can have a distinct set of beneficial metabolic effects of their own (Joubert. 2008). Rooibos Council. We can thus exclude any processing specific effects and simply assume that the results the scientists from the Stellenbosch University in South-Africa observed, when they administered the chloroform-methanol extract from the fresh tea leaves (1g of Rooibos leaves yielded 0.158 g extract) to their "subjects" - male Wistar rats. ... which means that whatever the tea does, must block the production, not increase the deactivation of corticosteroids, and as a SuppVersity reader you probably already know how that works!? Right! In plain English you would probably say: Some of the active ingredients in Rooibos tea have the marvelous ability to block the enzyme that's responsible for the conversion of in-active to active corticosteroids. The bad thing: This doesn't really work in human beings! For all the 7-keto lovers out there, this may sound awesome. It would after all mean that you could stop buying the overpriced DHEA-metabolite and start drinking some cheap Rooibos tea, unfortunately, Schloms et al. hid the results of a human study they conducted so cleverly in the abstract of their latest paper, that you one will easily overread that the 6-week intervention in which 24 women and 16 men between the ages of 30 and 60 years, with at least two or more risk factors for coronary heart disease (e.g. hypercholesterolemia, hypertension, or an increased BMI) consumed six cups of fermented Rooibos per day (15 g Rooibos leaves/subject) sucked, i.e. did not produce the desired results. 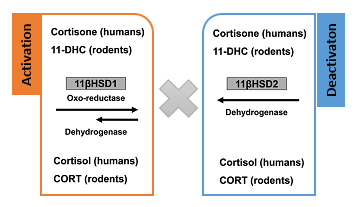 While there were significant decreases in the cortisone : cortisol (active : inactive corticosteroid) levels in both, men and women, there were no significant changes in cortisol, alone, testosterone, or the testosterone : cortisol ratio. 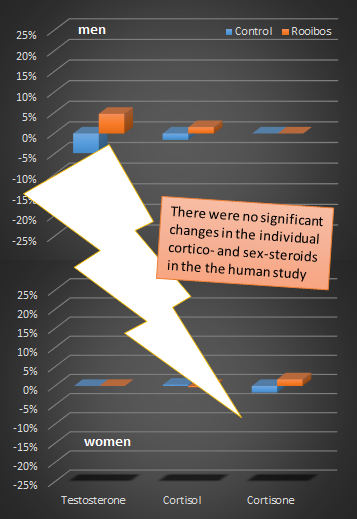 With to the large inter-subject variations for testosterone, there is yet a chance that it worked for some, but not all male study participants. Bosek, P., and M. Nakano. "Hepatoprotective effect of rooibos tea (Aspalathus linearis) on CCl4-induced liver damage in rats." Physiol. Res 52 (2003): 461-466. Breet, P., Kruger, H. S., Jerling, J. C., & Oosthuizen, W. (2005). Actions of black tea and Rooibos on iron status of primary school children. Nutrition Research, 25(11), 983-994. Gilani, Anwarul Hassan, et al. "Antispasmodic Effects of Rooibos Tea (Aspalathus linearis) is Mediated Predominantly through K+‐Channel Activation." Basic & clinical pharmacology & toxicology 99.5 (2006): 365-373. Hesseling, P. B., J. F. Klopper, and P. D. R. Van Heerden. "The effect of rooibos tea on iron absorption." (1979). Joubert, E., et al. "South African herbal teas: Aspalathus linearis, Cyclopia spp. and Athrixia phylicoides—A review." Journal of Ethnopharmacology 119.3 (2008): 376-412. Khan, Arif-ullah. "Selective bronchodilatory effect of Rooibos tea (Aspalathus linearis) and its flavonoid, chrysoeriol." European journal of nutrition 45.8 (2006): 463-469. Marnewick, Jeanine, et al. "Inhibition of tumour promotion in mouse skin by extracts of rooibos (< i> Aspalathus linearis</i>) and honeybush (< i> Cyclopia intermedia</i>), unique South African herbal teas." Cancer Letters 224.2 (2005): 193-202. Matsuda, Kazuhiro, et al. "Effects of continuous ingestion of herbal teas on intestinal CYP3A in the rat." Journal of pharmacological sciences 103.2 (2007): 214-221. Schloms, Lindie, et al. 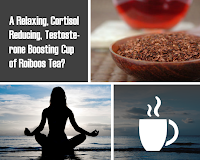 "Rooibos influences glucocorticoid levels and steroid ratios in vivo and in vitro: A natural approach in the management of stress and metabolic disorders?." Molecular nutrition & food research (2013). Shindo, Y., and K. Kato. "Effect of rooibos tea on some dermatological diseases." Proceedings of the international symposium on tea science. 1991. Sissing. "Investigations into the cancer modulating properties of Aspalathus linearis (rooibos), Cyclopia intermedia (honeybush) and Sutherlandia frutescens (cancer bush) in oesophageal carcinogenesis." M.Sc. (Physiology) Thesis. University of the Western Cape, Bellville, South Africa (2008). Verhoog, N. J. D., E. Joubert, and Ann Louw. "Screening of four Cyclopia (honeybush) species for putative phyto-oestrogenic activity by oestrogen receptor binding assays." (2007).